In a magical realm, a war has raged between the Norse gods and a powerful enemy called the Frost Giants. These adversaries have tried to infiltrate the majestic city of Asgard, which belongs to King Odin (Anthony Hopkins). Since they were young the king taught his sons that they must never start a war but only retaliate if truly necessary. His sons are Thor (Chris Hemsworth), an arrogant hammer-wielding warrior and the jealous Loki (Tom Hiddleston). 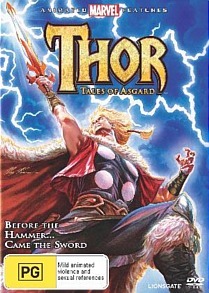 To respond to a sneak attack on the kingdom by the Frost Giants, Thor takes it upon himself to lead a group of his friends to punish the beasts. 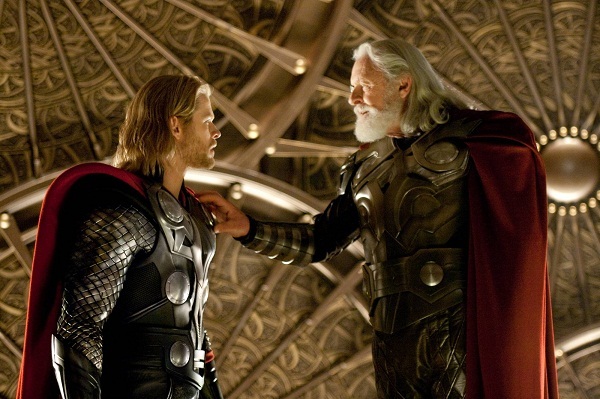 After barely surviving a deadly battle and having one of his men wounded, Thor is interrogated by Odin and banished for disobeying his father's order for peace. He is stripped of his powers and both he and his magical hammer are blasted out of the magic realm and into the real world. 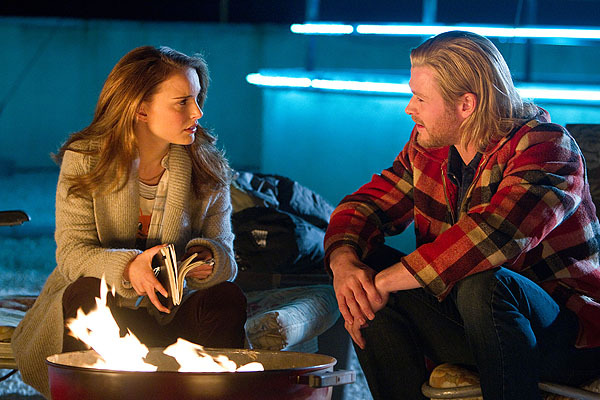 Crash landing on Earth, Thor is hit by the car of astrophysicist Jane Foster (Natalie Portman). She's been investigating the gateways between the real and magical worlds in the New Mexico desert. When her data is stolen by shady government agents, who have also set up a perimeter around the engraved hammer, she enlists the help of Thor to get both of their items back. Here is a film that is simultaneously comforting and dazzling due to its predictable narrative. We're so swept up by the visual exuberance of director Kenneth Branagh that the familiarity of an ageing king and his fractured kingdom rarely troubles us. There are predictable double crosses, some romance and opportunities for redemption. It's hard to go wrong with such safe, timeless and universal material. And given the steady hand with which the epic is presented, the film engages. The kingdom of Asgard is itself a stirring and magnificent creation. It's a golden fortress and a majestic city, sweepingly built upon and viewed from across the sea. The interiors are painted with a bronze palette, only to be crusted over by frosty intruders. It's a handsome film to look at, especially in 3D, where the long shots employ some brief but noticeable touches of depth. But disappointingly as the film progresses the 3D becomes less noticeable, particular in the second half. It probably wouldn't be worth paying the extra dollars just to see the opening quarter in 3D. And the only reason for not hearing some alarm bells during an early battle is because of the booming sound effects. There's a slickly handled sequence where Thor and his friends take down waves of enemies, but it also suggests that the film will, like many blockbusters, turn into a big budget video game. But after this lengthy stint in the magical realm something unexpected happens: the film develops a sense of humour. One of the most enjoyable aspects ofThor is when our reckless hero finds himself in the real world, but still retains his traditional Norse mannerisms. The fish out of water jokes work well because the scenes are actually funny and unexpected. The best of these comedic moments are when Thor walks into a pet store, announcing he needs a horse, and in a diner where he smashes a mug on the ground demanding more drink. Pay attention for a Tony Stark reference from S.H.I.E.L.D agent Phil Coluson (Clark Gregg) towards the end of the film, and also an extra scene after the credits too. I like Hemworth's performance in the comedic scenes the best. He plays them straight and serious, as all good comedy should be. His charisma does fade in and out, flashing a smile occasionally but largely being reduced to gruff manly, measured speak. Still, his testosterone voice recalls Russell Crowe in Gladiator and he's physically adept too. It's a step up from the Saddle Club and with more opportunities to develop his performance in the inevitable sequel he'll improve. Portman has him more than covered for charisma, though. I don't know what an astrophysicist is meant to sound like but she has boundless energy, with an adorable presence on screen. She's a lot of fun to watch. Hopkins has very little time and with mechanical dialogue there's less emotion to be found in his character or Thor's sidekicks. Regardless, the skill shown in the bloodless action sequences is apparent and the humour is relieving. Comic book fans and younger viewers will thrive here on a film that knows exactly what it is.